Chasing the Golden Rays: Making the Most of Your Solar Panels How much solar do I need? Caleb Thompson is part of Offroad Addiction TV, a small team who are dedicated to the 4X4 life. Whether it's tinkering with their trucks, filming, watching or getting out and enjoying the great outdoors they do it all. Based in New Zealand, their goal is to bring the offroad community closer together whilst promoting quality products and providing tips to ensure everyone makes it home in one piece. With REDARC looking to strengthen its involvement in New Zealand, we have teamed up with Offroad Addiction TV. Today we speak with Caleb in an effort to get to know him and how his passion for 4WD has evolved into a full-time gig. Tell us a bit about how Offroad Addiction started and what was the push to kick it off? Offroad Addiction was started due to us wanting a new challenge and to share our passion with the world. We had run a few public 4WD events, a winch challenge, a 24hr teams winch challenge, built a truck and competed in a couple of events, as well as selling 4WD gear for a couple of years. The push to kick it all off was a good friend inviting us over to Malaysia to crew for his team in the Rainforest Challenge (one of the Top 10 Toughest motor races in the world) we bought some camera gear, so we could show our friends back home what went on, this footage ended up being Season 1, Episode 2. 4WDing is still a relatively new concept in New Zealand but it's starting to take off, what do you think has been the reason for this? What do you feel NZ may be able to offer for those into 4WDing and overlanding that perhaps more ‘mature’ markets like Australia can’t offer? I’ve been told that people pay good money to get mud spread on their faces to look youthful, if that is what you’re into then we can offer as much as you like! I honestly can’t say we offer anything new, going around the world, our passion is the same, we have amazing scenery and history much like the rest of the planet, it’s the little things that we all take for granted until we are a tourist that makes it all worth it. What’s the best aspect of your job and what is the hardest? We get to travel to some epic locations and meet some amazing people that share the same passion as us. The hardest part sometimes is simply having to come home! For offroad use… that would be the one in my shed I’m currently building, we call it Project #TightSqueeze - a Suzuki Samurai SJ413 with ideas thrown in from a bunch of our travels. For road use… well watch this space, we will be building a new tow / touring rig in a year or two. Something we have been dreaming of for a few years. Life is short… build rigs and wheel em! Where is your favourite 4WDing destination in the North Island and a favourite in the South? North Island it has to be Thompson’s Track which we featured in a recent episode. There is just something magical about that place. South Island well as embarrassing as it is, you got me…… I’ve never been haha, got distracted by exploring the planet before turning over all the rocks at home. Definitely on the to-do list for the near future! What are the top three accessories you have installed in your vehicle? My REDARC 52mm EGT/ Boost Gauge - I like mashing the throttle, so it’s good to be alerted when I am doing it too much! Barwork - Sometimes I forget I’m in the shiny truck, Bit of protection becomes cheap insurance when you run out of talent. Tyres - Good tyres are a must, safety of yourself and passengers, not getting punctures in the middle of nowhere and having plenty of traction is always a good thing. If you could give one piece of advice to somebody who is 4WDing for the first time, what would it be? Go slow, make sure you have good recovery gear and rated recovery points, if you don’t know ASK, be safe and have fun! Once you're all set up at camp what’s your favourite way to unwind? Watching the sunset, with good company and a cold drink or 2 while we listen to dinner sizzle away. What’s your favourite camp cooked meal? We have had some insanely good meals in the middle of the Malaysian Rainforest but one I took home and made myself which is very basic consists of, Coconut Cream, Diced steak / Sausages, garlic, hot sauce, soy sauce, a splash of fish sauce served on rice…. And now I’m hungry! Complete freedom to go and film as much as we need with the ability to clear memory cards and start editing track side thanks to our Manager30 Battery Management System and 2000W Pure Sine Wave Inverter. The ability to monitor info like Voltage (Via the HMRF2000B RF Battery Monitor) and EGT / Boost Gauge on the fly is a sweet deal. Why did you choose to work with REDARC over other companies with similar product offerings? For us it is about practising what we preach, we only want to surround ourselves with brands we can trust, products that genuinely excite us and work well. Let’s face it there are cheaper alternatives everywhere we look these days but for peace of mind and reliability, it’s worth going with a brand that specializes in the industry and stands behind their gear. Remember this when you shop for your REDARC gear next time… The quality remains long after the price is forgotten! 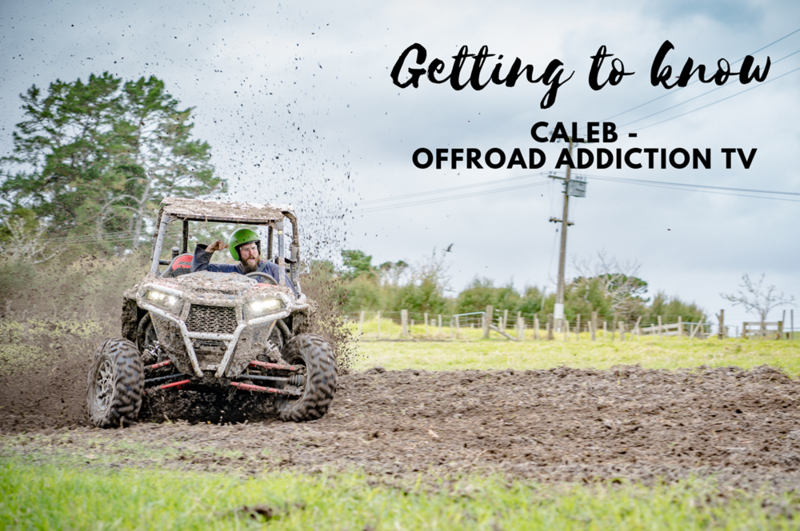 Thanks to Caleb for his insights, you can keep up to date with Offroad Addiction TV through their website, Facebook and Instagram.